Healthcare workers are more tolerant of violence by patients than almost any other occupations would tolerate violence by customers or clients. In fact, according to OSHA, healthcare workers are more than 4 times more likely to experience workplace violence resulting in days off work than private industry. Patients are the source of workplace injuries (80%), followed by patient family members/friends (12%), students (3%), and co-workers (3%). However, it is estimated that only 50% – 70% of assaults are reported to managers. A 2014 survey of 3,765 nurses found that 21% had been physically assaulted in the preceding 12-months and more than 50% reported being verbally abused in that time period. A 2011 survey of 7,169 emergency department nurses found that 12% of the nurses had experienced physical violence in the preceding 7 days and 59% had reported verbal abuse during those 7 days. 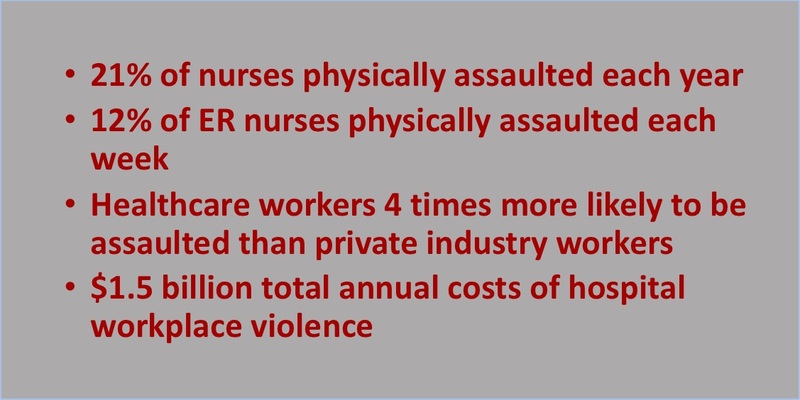 Another 2014 study of 762 nurses found that 92% of emergency department nurses had experienced verbal or physical violence in the preceding year with the most common physical incidence being grabbed (56%), scratched (47%), kicked (41%), pinched (40%), shoved (29%), spat on (34%), slapped (18%), punched (17%), hit by a thrown object (16%), urinated on (13%), or bitten (10%). A 2002 survey of 72,349 healthcare workers at 142 Veterans Administration hospitals found that 13% had been assaulted in the preceding year. 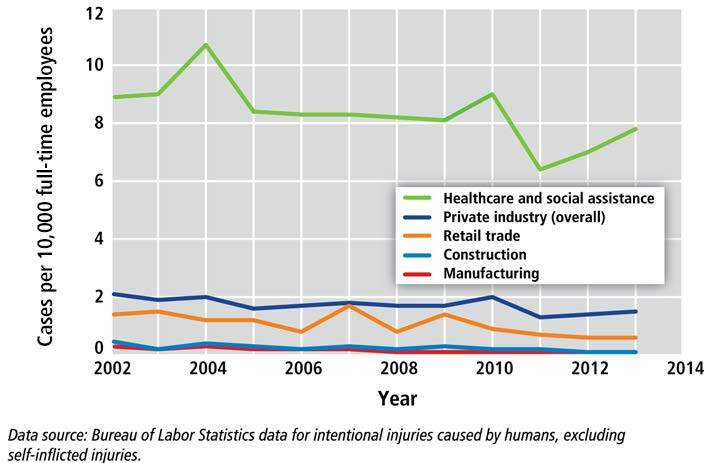 Within healthcare, some jobs are at greater risk than other, for example, psychiatric aides are the most likely to sustain violent injury and are 10-times more likely than the next group, nursing assistants who in turn are 4-times more likely than registered nurses. A sense that it is “just part of the job”. An unwillingness of healthcare workers to stigmatize their patients when the violence may be a reflection of their underlying disease. An ethical duty to continue to provide care to a patient, even if the patient’s behavior is poses risk of harm to the healthcare worker. 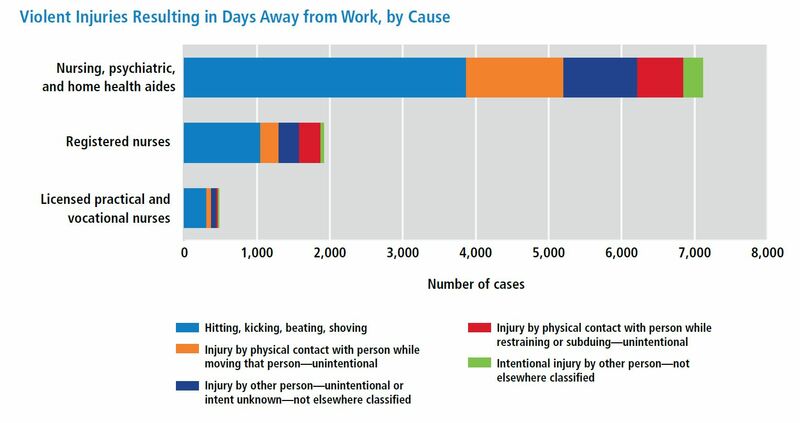 The most common violent injury sustained by health care workers is being hit, kicked, beaten, or shoved. The next most common injury is from unintentional harm when moving the patient. Health care violence is also very costly. The direct cost at one hospital system for 30 nurses who required treatment for workplace violence over the course of a year was $94,156 ($78,924 for treatment costs and $15,232 for lost wages). But those direct costs are only the tip of the iceberg of total costs. The indirect costs of caregiver fatigue, burnout, and stress can be enormous as these factors have been associated with increased medical errors, lower patient satisfaction, and higher health care worker turnover. As an example, it costs about $65,000 to replace an RN when separation, lost productivity before a replacement is hired, recruitment, hiring, orientation, and training are all considered. All told, the American Hospital Association analyzed the financial statements of estimates that community and workplace violence costs U.S. hospitals $2.7 billion per year. If only in-facility violence is considered, the cost is about $1.5 billion ($278 million per hospital). When these costs are broken down, they are 31.6% for security staff and infrastructure, 6.5% for staff training, 3.6% for procedure development, 8.7% for staff turnover, 3.4% for disability, 2.0% for absenteeism, and 1.6% for staff medical care. There are a number of organizational factors that can reduce hospital workplace violence. Ensure that staffing is adequate, particularly during meals and visiting hours. Avoid crowded waiting rooms and long waiting times for patients. Community disaster drills are done twice a year in most hospitals. But it is also important to do violence response drills, such as active shooter drills. These can be very effective in creating awareness for alarm locations, security support, escape routes, safe room locations, and emergency communication procedures. Above all, hospital leaders must foster the perception that workplace violence is never OK and that the organization takes workplace violence and its prevention seriously. When faced with patients or their family/friends who are threatening violence or who are actively violent, healthcare personnel should have a low threshold for calling hospital security or police. Security personnel are generally trained in de-escalation techniques as well as ways to restrain patients without harming them. Most hospitals do not arm security personnel with guns but Tasers are becoming more common to use in those situations where a violent patient or visitor is in danger of harming others or themselves. It is not a crime when a patient who is delirious from sepsis kicks a nurse but when an otherwise alert and oriented patient throws something at that nurse or punches that nurse, it may very well be a crime. 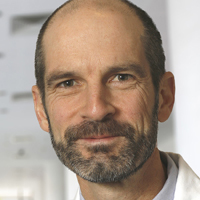 Some patients have a history of repeated violence or threats of violence; hospitals cannot always deny those patients emergency care but they can facilitate criminal charges against those patients. When people are sick, injured, or dying, the emotions of these people and their friends/family can become untethered, resulting in physical or verbal violence directed toward others. Because healthcare workers are especially vulnerable to this physical or verbal violence, our hospitals must take steps to prevent and respond to workplace violence, perhaps more so than any other workplace environment.